If you have been the victim of sexual harassment and want to explore your options for holding the perpetrator accountable, turn to the Law Offices of Joel W. Baruch, P.C. Joel Baruch is proud to help employees assert their rights in the workplace. Call 949-864-9662 to schedule a case evaluation with an Irvine sexual harassment attorney. Requests for inappropriate favors of a sexual nature. When it comes to sexual harassment, every case is different because this kind of workplace discrimination takes many forms. For example, the gender of the victim and perpetrator does not matter. A case might involve a man and a woman, two men, or two women. The relationship between the victim and harasser is also irrelevant. The harasser might be the victim’s supervisor, co-worker, or subordinate. It may even be a non-employee, like an individual who represents one of the company’s many vendors. In some cases, the victim may not be directly involved in the explicit exchange. If your coworkers partake in offensive conduct that makes you uncomfortable, for example, you may be the victim of sexual harassment even if you were not necessarily their intended target. Massaging someone’s neck or shoulders. What Should You Do If You Have Been the Victim of Sexual Harassment? Because of the prevalence of sexual harassment, most workplaces are equipped to handle complaints. If you work for a smaller company that does not have its own human resources department, though, you may not know where to turn. In such a scenario, it is wise to call on an aggressive attorney. In fact, you should consider seeking legal counsel even if your employer handles claims internally because even the most compassionate HR representative must ultimately protect the best interests of the company, not of individual employees. If you have been the victim of sexual harassment at work, turn to the Law Offices of Joel W. Baruch, P.C. Our attorneys have litigated more than 200 trials. 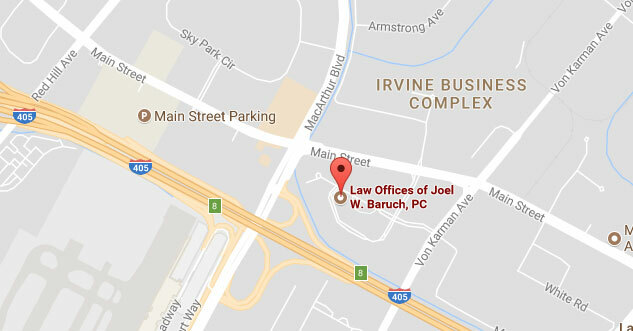 Call 949-864-9662 to schedule a consultation with an Irvine employment law attorney. If you want to learn more about employment law in California, visit the USAttorneys website.